Relationship ruts are so easy to fall into. Even when you’re crazy about your partner, we all find ourselves doing the same thing every night: eating dinner and then retiring to the couch for exactly 1.75 hours of Netflix before hitting the hay. Sure, it’s comforting, but it can also get monotonous. Adding a little somethin’-somethin’ into your routine can reignite that spark, and yoga is just what the doctor ordered. 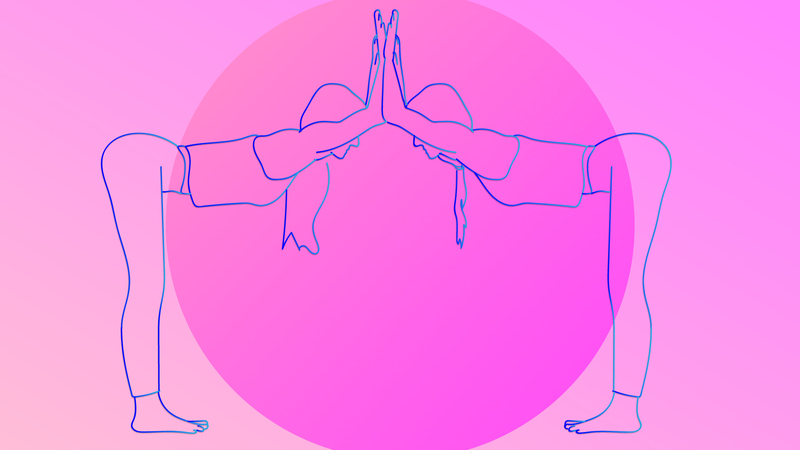 These yoga poses for partners can be a little challenging, but are also great for beginners — you don’t need to be a yoga expert to get through this practice. Just remember to always listen to your body, and don’t do anything that hurts. And don’t forget to laugh and have a blast connecting with your partner. Start in a seated position with legs crossed at the ankles or shins, with your backs resting against each other. Rest hands on thighs or knees, and allow yourself to feel and connect with your partner. Begin to notice how the breath feels as you inhale and exhale; especially notice how the back of the rib cage feels against your partner’s. Begin to “breath alternate” with your partner, so as you inhale, he or she exhales; as he or she inhales, you exhale. Practice for three to five minutes. This is a gentle way to connect with your partner, helps open the heart and is an easy way to connect with your breath. Start in a seated position with legs crossed at the ankles or shins and your backs resting against each other. Rest hands on thighs or knees and allow yourself to feel and connect with your partner. Inhale and reach arms overhead, lengthening the spine as you reach up. Exhale and twist to the right, bringing your right hand to the inside of your partner’s left knee and your left hand to the outside of your right knee/thigh. Your partner should mirror the movement. Twists help cleanse the body and assist in the detoxifying process. This is also a fun way to initiate playfulness with your partner. 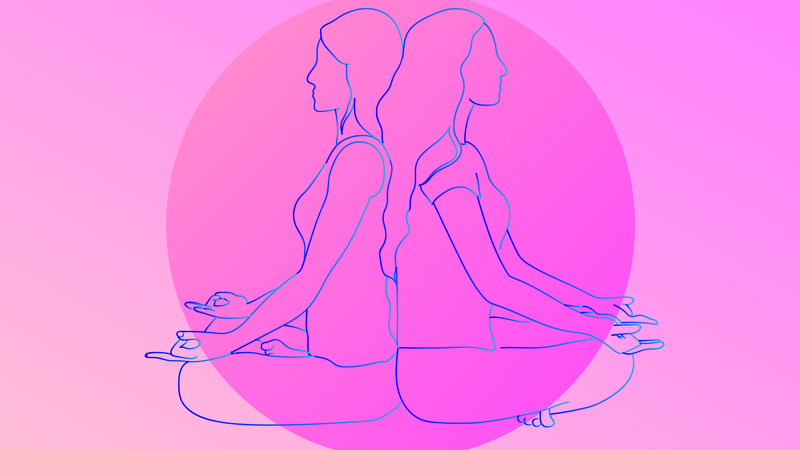 Start by facing each other in a standing position. Step feet under hips, then inhale, extend arms overhead, and begin to hinge forward at the hips until you meet hands with your partner. Slowly begin to forward fold, bringing elbows, forearms and hands so they rest against each other. Rest equal weight against each other and release chest and belly toward the floor. Hold for five to seven breaths, then slowly walk toward each other, bringing torso upright and release arms down. This helps open the shoulders and chest, which is the seat of our energetic heart. Start standing next to each other facing the same direction. Standing a few feet apart, bring palms toward each other with the arms in a “T” shape, or draw the elbows and palms together in a cactus shape. Begin to shift weight onto your right foot and have your partner shift weight onto their left foot. Draw the opposite leg into tree pose by bending the knee and bringing foot to the ankle, calf or inner thigh of the standing leg. Balance for five to seven breaths, then release and turn around to face the opposite direction and repeat on the opposite side. Balance poses encourage focus, and this specific pose invites playful focus while being a gentle hip opener. Both start in a Tabletop Position, one in front of the other. Walk knees and feet back 5 or 6 inches, tucking toes under so you are on the balls of the feet. On an exhale, lift sit bones upward and bring the body into a downward “V” shape so you both start in a traditional Downward-Facing Dog pose. Begin to slowly walk feet and hands back until it is accessible to gently walk your feet to the outside of their lower back, finding the back of their hips until you are both in a stable and comfortable position. Communicate with each other as you move through the transitions, making sure to honor each other. 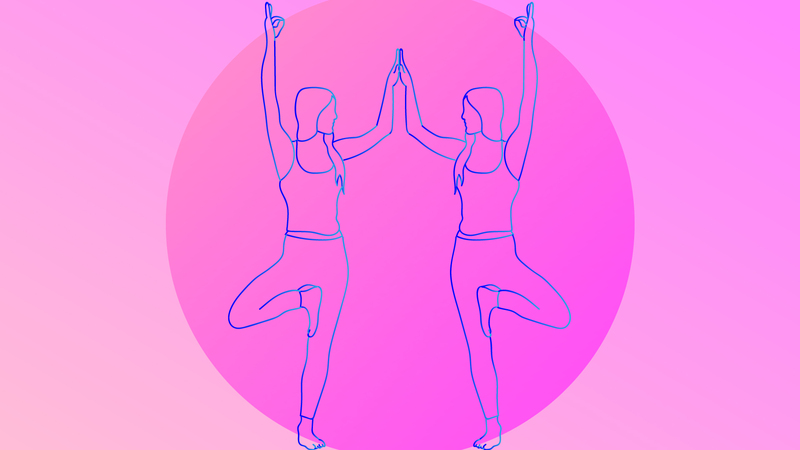 Hold for five to seven breaths, then have your partner slowly bend knees, lowering hips down toward tabletop, then Child’s Pose, as you slowly release feet to the floor. You can repeat with the opposite person as the “base” down dog. This is a gentle inversion that brings length in the spine. It also inspires communication and closeness. From a seated position facing each other, extend legs out to a wide “V” shape, with kneecaps facing straight up and soles of the feet touching. Inhale and lengthen up through the spine. As you relax into the pose, allow yourself to soften into it. Stay in the pose for five to seven breaths. To come out of the pose, release each other’s arms and bring torsos upright. Repeat in the opposite direction, bringing your partner into the Forward-Fold. Feels so good! This pose opens the hamstrings and calms the nervous system. Find a comfortable seated position facing each other with your knees bent and toes touching. Reach out for your partner’s wrists and hold them snugly. Begin to walk soles of the feet together, bringing knees slightly toward the chest. Using your hold as leverage, lift chests toward each other, straightening your spines as much as possible. Keeping the spine straight and chest lifted, slowly begin to straighten legs. This is a challenging pose; stay playful and maybe try straightening one leg at a time. Hold for five to seven breaths, then gently release feet back to the floor. This pose is energetic and gently works the core. It is playful and encourages laughter. 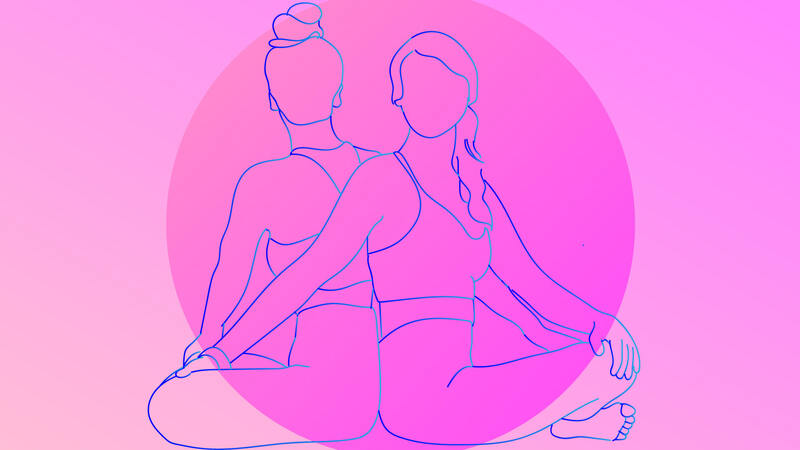 After finishing the poses, come to a neutral position lying next to each other on your backs in Corpse Pose, maybe resting hands together gently. Allow the body to completely relax with your eyes closed. Feel the closeness with your partner and your connection to the present moment. Relax in this pose for three to five minutes before completing your practice. 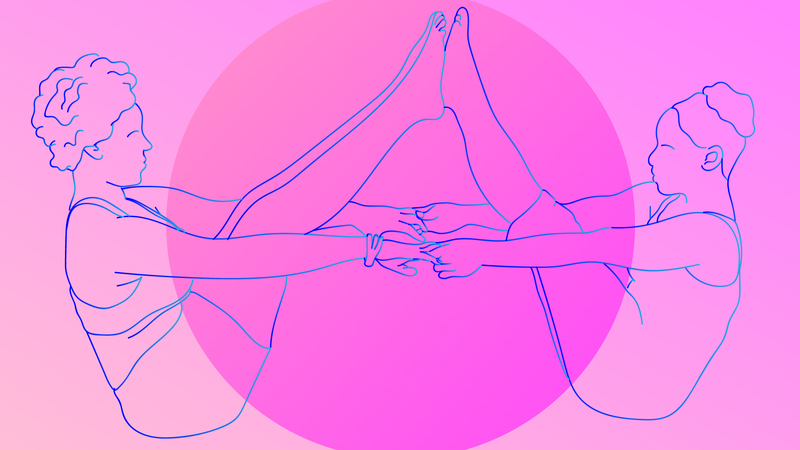 Get to know your partner and yourself better with these duo-driven poses. If you and your partner love them, look for acroyoga classes in your area to explore more.